My PhD research in Senegal! 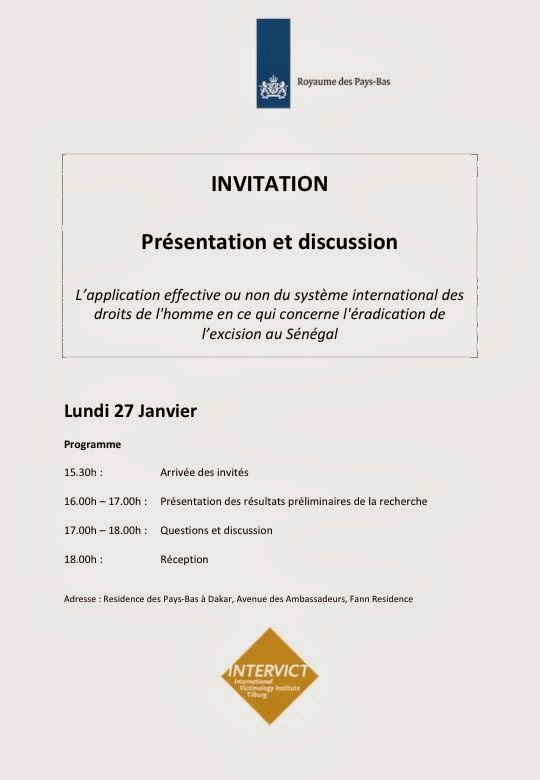 Last Monday, the 27th of January, I organized a conference at the Residence of the Netherlands Embassy in Dakar to present my preliminary research results. The title of my presentation was: "Compliance with the international human rights framework with regard to Female Genital Mutilation/Cutting in Senegal." In the past 4 months, I interviewed 54 people with many different backgrounds, for example Imams, doctors, parliamentarians, government representatives, academics, people working for international organizations (UNICEF, UNFPA, OHCHR, WHO, UN Women) and people working for NGOs. I invited all the people I interviewed to come to the conference where I would present my preliminary research results. After I send out my invitations, I immediately received many applications. I was positively surprised, because this was absolutely not typically Senegalese! ;-) The regular readers of my blog know how difficult it often was to make appointments and schedule meetings. However, last Friday I even had to rent 30 extra chairs because many people wanted to attend the conference!! It was so nice to see almost everybody I interviewed again and I received compliments about the list of persons I interviewed. "How did you manage to speak to all these people in just 4 months?" was a frequently heard remark. :-) My presentation was followed by a lively discussion with interesting comments and suggestions. Our Ambassador Pieter Jan Kleiweg de Zwaan moderated this Q&A session. The interesting debate showed the sensitivity and complexity of the subject as well as the large variety of views, practices and interests of all the different actors working in the field. Further more, I was very honored that professor Gerry Macky attended my presentation. Gerry Macky is a very well-known professor from the United States and he is currently in Senegal for a few weeks for his research. He is a political theorist and developed the 'social norm theory'. In the past years, I have studied his work extensively and I have read all the academic articles he published. It was great to have the opportunity to meet him and to explain him what my own PhD research is about. It's time for a glass of wine! Chatting with prof. Gerry Macky. Marie Sabara (UNICEF), Daniela Luciani (UNICEF) & me! Yesterday was unfortunately my last day at the Netherlands Embassy. I am really thankful that I had the opportunity to work at the Embassy for two days a week. My colleagues welcomed me so warmly. I enjoyed it very much and it contributed greatly to my PhD research. It was so nice to have an office (and airco!) for two days a week, instead of working from my apartment or in a cafe. Apart from that, they were great people and I really enjoyed the lunches, dinners and drinks we had in the past months! Anita, I will miss you! Gerco, I will miss you!!! Tomorrow I will say goodbye to my friends here in Dakar - probably with a 'flag' beer on one of Dakar's beaches - and on Saturday I will pack my backpack and fly back to the Netherlands in the night. I arrive early Sunday morning. I would not have been able to really understand how complicated the issue of FGM/C is, without spending these months in Senegal. I enjoyed every minute of my research in Senegal and I feel so lucky that I have the opportunity to be here. I am very thankful for the grants of McKinsey & Company and the Alumni Fund of TLS with which I am able to finance my case study. Without them it would not be possible! In addition, I would like to thank my interns Alina, Maria, Sofia and Jason - four students of the Master Victimology and Criminal Justice. I offered them an internship and they are helping me out with the transcriptions of the interviews and other related research tasks. They are doing a great job! Without them it would not have been possible to present my preliminary research results. Together we already transcribed 25 of the 54 interviews and therefore I was able to do a quick analysis in the past weeks. Keep up the good work, I really appreciate your help! Lastly, I would like to thank my husband Erik, for giving me the opportunity to follow my dreams... I love you (and miss you) so much. See you all very soon, I can't wait!! Time is flying, in two weeks I will fly back to the Netherlands! In this blog post I will reflect on my work of the past 3,5 months here in Africa. The topic of my PhD research is Female Genital Mutilation/Cutting (FGM/C), a practice that involves the partially or totally removing the external female genitalia or otherwise injuring the female genital organs for non-medical reasons. About 140 million girls and women worldwide are currently living with the consequences of FGM/C. The international community recognizes FGM/C as a form of Violence Against Women and a violation of the human rights of girls and women. The majority of African countries have committed themselves to protecting the rights of women and girls by ratifying a number of international and regional treaties. Despite global efforts to promote abandonment of the practice, FGM/C remains widespread. Taking into account the above, I asked myself the following questions: What is the impact of the international human rights framework? Do states comply with this framework? If so, why and how? And if not, why not? Can human rights possibly make an end to the highly entrenched and revered custom FGM/C that has existed for nearly two thousand years? The aim of my field study was to find answers to these questions. I chose Senegal as a case study mainly because of the FGM/C prevalence (26%), type of FGM/C performed, religion (94% Muslim), degree of democracy and presence of civil society. On paper, everything looks very promising. 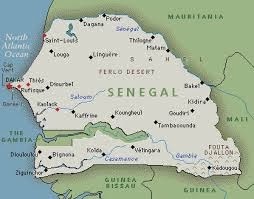 Senegal signed and ratified all relevant human rights treaties, since 1999 there is a law that criminalizes FGM/C, there are two National Action Plans, there is a strong civil society and the famous NGO Tostan is advocating for change through their human rights education programmes. However, the law is not enforced and there have been only a few court cases. There is only a slow decline in prevalence of FGM/C in Senegal. How can that be explained? I travelled to Senegal in May 2013 for two weeks for a pilot study. When I arrived in Dakar, I did not know anybody. Via one of my supervisors I met Bijou, a lady who later became my translator and friend. During my pilot study, I stayed in her house where she lived with her mother. I used these two weeks to find out which actors work in the field of FGM/C in Senegal and to introduce my research to them. I also tested my questionnaire. I found out that people were very open and willing to talk about the subject, which was so nice! The mother of Bijou worked at the Family Ministry, which is responsible for the policies regarding FGM/C. During my pilot study, I worked there a couple of days, which provided me already with very interesting insights. After my pilot study, I returned home to the Netherlands to prepare my field work. At the end of September I returned to Dakar for four months. My aim was to conduct semi-structured interviews with experts regarding FGM/C at the government level, international organizations and civil society organizations. During the interviews, I asked questions about the ratifications of treaties, the national law against FGM/C, the court cases, the National Action Plans, other policies and strategies, data collection and research, the role of the government, the role of the UNICEF-UNFPA Joint Programme, the role of civil society organizations, support services, trainings for professionals, etc. My aim was to conduct 50 interviews in four months, and last Friday I conducted number 47! My goal comes into sight!! During my interviews, the people here provide me with interesting insights that make me really understand the underlying complexities regarding FGM/C. I remember that when I wrote my PhD research proposal, I found it incredible that a mother could do this to an innocent young girl, to her own daughter. I was wondering how it could be that in the 20th century such practices still occurred. Now I understand that the mothers really love their daughters. They want the best possible life for them and with the cultural, social and religious norms established in their community, they feel that FGM/C is the only option. The pieces of the puzzle of compliance are now starting to fall into place. During my internship at the Family Ministry – responsible for the implementation of the human rights framework regarding FGM/C – I found out that this Ministry does not really have the capacities to properly implement the human rights framework. There is a lack of human, financial and material resources. In addition, the role of religious and community leaders should not be underestimated at the national and community level. Another interesting finding is that it is important to have a law, but not for punishing purposes. According to the majority of the people I interviewed, the focus should be on sensitization of the communities, rather than punishment. Because as long as the people do not understand why FGM/C is a criminal offence, they would rather choose to go to jail and live up to their social, cultural and religious norms. In the remaining two weeks I will conduct more interviews and I am also organizing a conference about FGM/C in Dakar. It will take place at the Residence of the Netherlands Embassy. During the conference, I will share my research results with the people I interviewed and others working in the field of human rights and FGM/C. I already have many applications, which is so nice!! Last week it was great to open my e-mail box and to have a look at the e-mails I received. :-) I received e-mails stating for example: "Toutes mes félicitations pour cet excellent travail" and "Your list of persons interviewed is impressive". I would not have been able to really understand how complicated the issue of FGM/C is, without spending these months in Senegal. I enjoyed every minute of my research and I feel so lucky that I have the opportunity to be here. I did everything I wanted to do, perhaps even more. I can't wait to analyze my data and start writing my chapter. I am very thankful for the grants of McKinsey & Company and the Alumni Fund of TLS with which I am able to finance my case study. Without them it would not be possible! Finally, drinking a cappuccino together again! Friday night: Celebrating the weekend! It is crazy to realize that I came here in May and I did not know anybody. Now, I feel sad to say goodbye to so many beautiful and interesting people. The Netherlands Embassy offered me a place to work for two days a week and I will miss my colleagues (especially the lunches!) there. I will miss the climate (still 27 degrees! ), I will miss the Senegalese tea, the nice guy at the boutique at the corner of my street where I buy a pain every morning, the beautiful beaches, my favourite Island Ile de Ngor, the crazy taxi rides and the Senegalese teranga. First of all, I would like to wish everybody a happy New Year! It was very special to celebrate Christmas and New Year's Eve together in Africa. We enjoyed every minute together and we had so much fun! The first day of Erik's visit, I surprised him with a trip to Îles des Madeleines, an Island off the coast of Dakar. It is the smallest national park in the world, and a UNESCO World Heritage Tentative List site. It is such a beautiful Island and I couldn't wait to go there. We were lucky with the weather, 27 degrees and no high waves, so the pirogue (traditional boat) did not have any problems to bring us there. The Island was indeed a little paradise and uninhabited by man. According to our guide this is the case because it was inhabited by evil spirits in the past and now nobody wants to live there. Both very tired, but it was really cool!! Christmas eve we went to a restaurant in the city center of Dakar. We enjoyed a six-course meal and it was the first time we had a Christmas feeling. It is still summer in Senegal, with temperatures around 25-30 degrees. That did not contribute to our Christmas and New Years' feeling. At the same time, Senegal is a Muslim country and the people do not really celebrate Christmas. In some streets you see Christmas decoration and lights, but it is not very common. However, when we enjoyed a delicious dinner next to a 'Christmas tree', we knew 100% sure it was indeed Christmas. After spending some days in Dakar, it was time to travel around in Senegal after Christmas. We traveled up north the coast and the Lompoul desert was our first stop. We arrived at the desert just before sunset. We slept in a tent with outside toilet and shower and there was an amazing restaurant. When we arrived, a guy was preparing some meat (we couldn't discover which meat, perhaps a goat) on the barbeque. It tasted delicious! After two days in Lompoul, we went further up north the Senegalese coast to the city Saint Louis. We travelled the 'Senegalese way' with public transport and the people were wondering why these two toubab's (Wolof word for white person) decided to travel this way. But after we spoke a bit in my limited Wolof and negotiated the price (no toubab price for us! ), our backpack was hoisted on the roof of the bus, and we were on our way to St. Louis! The bus from the inside! When we arrived in Saint Louis, we took a taxi to the hotel where we stayed for 5 days. The hotel was owned by a Belgium couple and could use some renovation, but it was a perfect base from which we were able to make several trips. Saint Louis was the capital of the French colony of Senegal till 1902 when the capital was moved to Dakar. We made a nice 10 km walk in the city center. The old colonial buildings and houses were so pretty. In that sense, Saint Louis is much more beautiful compared to Dakar. The next day, we visited the National Park Djoudj, which is famous because of the millions of migrating birds that visit the park each year. The Park is located close to the Mauritanian border, an hour ride from Saint Louis. Especially this time of the year, when birds just crossed the Sahara, this park is full with birds, especially pelicans. It was really amazing and we both felt we were in an episode of Discovery Channel. ;-) Apart from many birds, we also saw crocodiles and a snake. The 1st of January we went to the Reserve of Guembeul. It was a relatively small national park, but very beautiful. With a guide, we made a hike through the park and we saw many animals, such as turtles, gazelles and monkeys. After we visited the park, we also went to a small village, where we took a pirogue (traditional boat) and visited National Park Langue de Barbarie, where the sweet water of the Senegalese river and the salt water of the Atlantic Ocean reach each other. The next day, we traveled back to Dakar in a sept-place. The last day of Erik's visit, we went to the beach of Yoff again and he took another surfing lesson. It was a very beautiful day, 30 degrees, and he did so well!! Below you'll find a few pics and a short movie. After two wonderful weeks together, it was time this weekend to say goodbye... It was difficult to let him go at the airport and to take a taxi back to my apartment all alone. Nevertheless, I am looking forward to the upcoming four weeks. I identified around 15 more people I want to interview and I will be busy organizing a conference at the residence of the Ambassador to present my preliminary research results on January 27. And, last but not least: tomorrow I will pick up Eefje and Stephane who will be part of my Senegal adventure for 10 days! I am really looking forward to see them. I am sure we'll have a good time! We are traveling since November 2015 and we have been in Malaysia, Australia, the Philippines and now in Africa. We will keep you updated about our adventures via this blog! Copyright by Annemarie Middelburg. Simple theme. Theme images by andynwt. Powered by Blogger.